Eclectic Paperie: Hot Air Balloons . . . love them! My Granny turned 92 this year!! I am going to get to visit with her this week in Scotland! SO excited! I wanted to make something for her, but really, what kind of art piece would a 92 year old like to have? While I was sitting in traffic, having this conversation in my head, a hot air balloon drifted across the horizon . 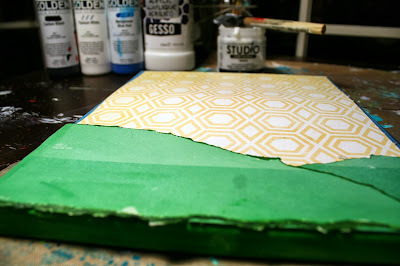 . . sometimes inspiration comes and knocks us over our head. This is the piece I made for Granny! I cut out balloon shapes from plain white paper. 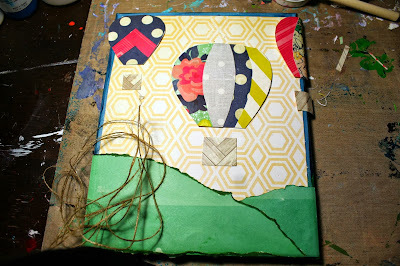 Then I pieced in the patterned paper on top to give the balloons some color! 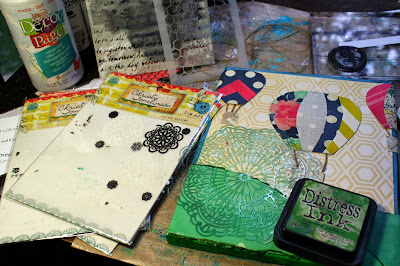 Then I added my texture layers ... Distress Ink into a stencil, rub-ons, doodling and stamping around!! 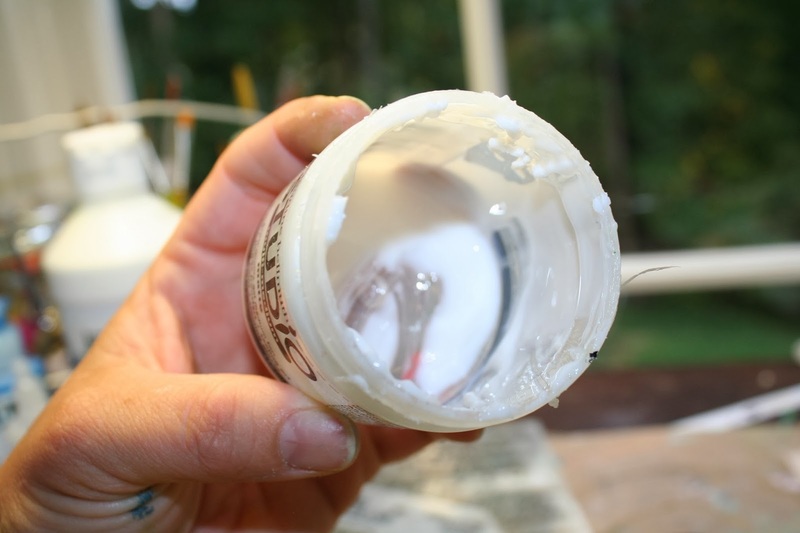 I sealed it all in with my matte medium and realized I had finished the jar . . . I LOVE this stuff. I can't tell you how it has changed my life!! I used to use Decoupage ALL the time however, I found that it was sticky and goopy when I didn't want it to be. 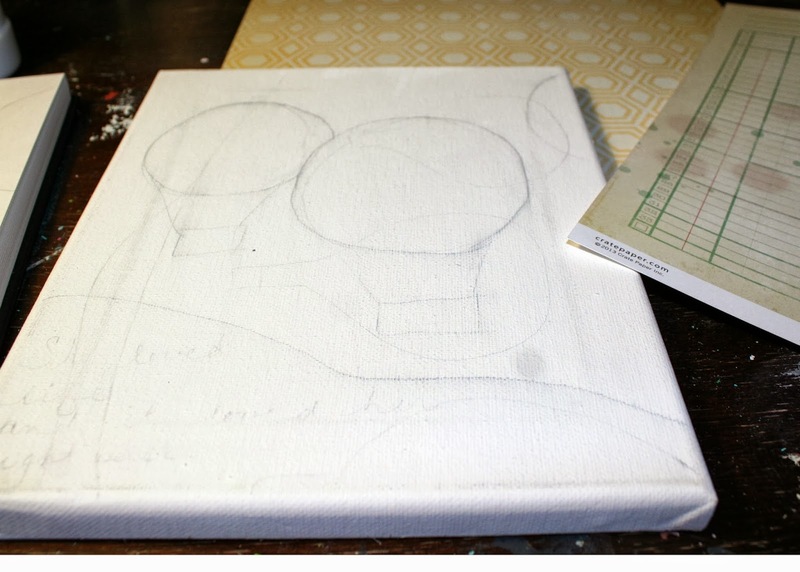 Then I ordered some of Claudine Hellmuth's matte Medium from ePaperie. It is amazing!! Thick, quick drying and so good for gluing and sealing!! LOVE IT! Amazing Karen! I adore what you do with paper...this is simply beautiful! Enjoy your trip and a big happy birthday to your granny!! OMG, love love love. 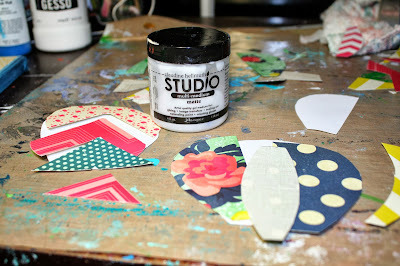 Love the paper piecing. 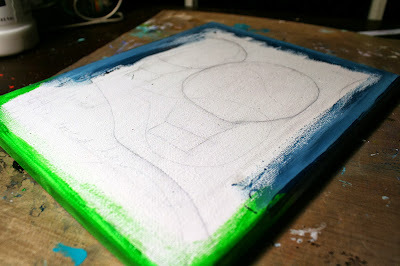 I love the whole canvas. Such a great theme/idea and I bet your granny loved it. I just LOVE how you were inspired and the canvas you created! Granny will LOVE this! 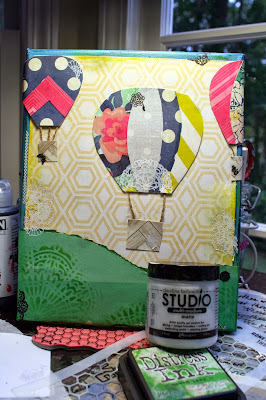 The hot air balloons are FAB but the doily on the green hills is my FAVORITE! 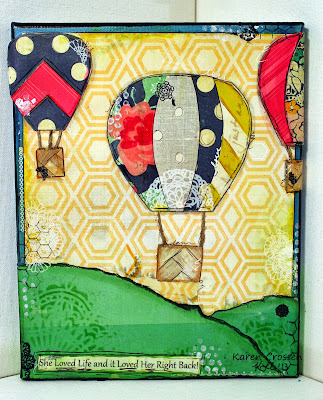 I LOVE your hot air balloons! What a great art piece for your Granny! I hope your visit is just wonderful! I hope Granny LOVES her hot air balloons! I'm sure she will simply because you made them with such love. I always enjoyed the hot air balloon rides a lot.